Classic Art Deco upstairs-downstairs eatery and drinking parlour with huge picture windows, pistachio leather banquettes, chandeliers, sugar bowls, and a French billiards table, which serves an enormous range of snacks from 06:00 through to 03:00, and more substantial meals from 13:00 to 01:00, every day of the year. Velódromo was taken on by the Moritz brewery in 2009 who restored it, installed wi-fi, and commissioned Michelin star chef, Jordi Vilà (Alkímia) to design an ambitious gastropub type menu. As you’d expect all the Moritz branded beers are available, and they serve an interesting line of cocktails (€ 7 before 20:00). And they serve hangover tapas, and a range of breakfasts. It’s not cheap, but it’s not prohibitively expensive. It’s a great place for a coffee and a bite together with a newspaper/tablet/laptop in the morning or afternoon. And a good place to meet up for drinks in the evening. 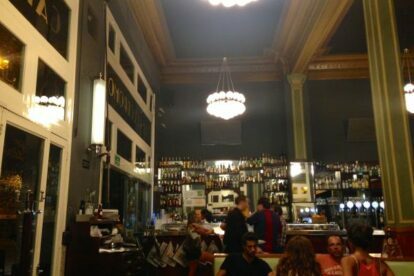 A friend visiting from the UK described it as a “posh Wetherspoon’s”, and I get what he means; however, there is a lot more to the place than that, and it’s well worth a visit. Be aware that though the menus, in Catalan, English and Spanish, clearly state that the place is open 24 hours a day, 365 days a year, IT IS NOT. I cannot understand why Moritz, who pride themselves on their clever marketing, persist with this misinformation. It just pisses people off – as it did me at 05:00 one rainy morning.